A whole battalion of Sugar Ants Trumped the Trump. Thought there would be a Fourth of July picnic but a war has broken out. This isn’t Trump Plaza.Some prevention tips on how to keep Sugar Ants From Trumping 4th of July Picnics:plenty of planning going on right now in preparation to celebrate the 4th of July with a huge picnic and fun activities. Independence Day comes along at a time of when there is plenty of outdoor grilling, BBQ’S and picnics. But all of these events can turn sour quickly. One huge helpful hint in prevention of Sugar Ants would be Picnic Tables Set Up Tips. Picnic tables offer major targets for ants. The pests seem to know instinctively that there’s good food to be had on the picnic table that is set up outside. Independence Day is a day of Sugar Ants war on the festivities. Try placing each leg of the picnic table into a half cup of water. One of the ants flaws is falling into the water and drowning. A drowned ant is an ant that won’t be able to ruin the Independence Day picnic spread set out for all to enjoy. Sugar ant is a common name that many people use to describe any small tiny little black ants that is attracted to sweets. However, the sugar ant is actually the species Camponotus consobrinus. Most people often use the name “sugar ant” to describe many different types of ants. Small to medium-sized ants that do not sting are identified by this name. Common examples of ants called “sugar ants” are pharaoh ants, odorous house ants, acrobat ants, etc. Properly identifying the species is mandatory. In order to correctly manage any infestation the culprits have to be identified. The actual species can vary greatly as to their biology and nesting habits and therefore how they are treated. When ants invade a home, it is best to contact a pest control professional to properly identify the ant and develop an effective management strategy. Winged male sugar ants with royal blood are completely black, while female workers have orange-colored bodies. Ants can mean real trouble for veggies and ornamental plants, the food of choice for mealybugs and aphids. Controlling ants in the lawn is a good way to minimize the population of these pest insects. Ants prefer dry, well-drained soil in an undisturbed, low traffic area. Lawn dwelling ants are generally not an issue because these are not the stinging sort but some species have a habit of undermining grass roots and can cause large dead patches in the lawn. Another issue is ant hills in grass, which can become large and pose a tripping hazard and make mowing difficult. For low populations, Simply raking out the hills will scatter the population and reduce hardened mounds from occurring. They tend to concentrate in a small area and spot application isolates the chemical zone and minimizes damage to beneficial insects who also call the grass home. Ants treatments include bait, spray or granular form. Locate the nest and apply the chemical as indicated on the label. Granular forms require activation with water, so it is best to irrigate after applying the chemical. In all cases, wait until a treated area has dried before allowing children and pets into the toxic zone. Ants can be a blessing and a curse, so consider the severity of the problem before resorting to chemical treatments. Their activity is also a natural pest control and can increase the tilth of soil, acting as wild aerators to loosen the dirt around roots and enhance growth. Sugar Ants can locate a reliable source of food inside a home in no time.The ants are and can become a huge headache. 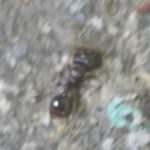 If there is the slightest suspicion that there is a sugar ant infestation of your home its time to take action. As soon as possible check the kitchen, pantry and all food containers. Sugar ants are drawn to spills, stains, food left in drains and other food residue. It’s time to start cleaning immediately. There may have been some home remedies used but to no avail. 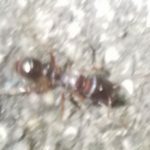 Now it’s time to contact AMPM Exterminators to eliminate the armies of ants surrounding your property and in your home. The general public often uses the name “sugar ant” to describe many different species of ant. Any small to medium-sized ant which doesn’t sting is referred to by this name. Common examples of ants called “sugar ants” are pharaoh ants, odorous house ants, acrobat ants, etc. Another example of the use of a general name applied to multiple species would be using “water bug” to describe cockroaches. Proper identification of the species is critical to correctly managing any infestation. Unfortunately people often believe that all “sugar ants” are one type of pest and that a single strategy works for against them all. The actual species can vary greatly as to their biology and nesting habits and therefore how they are treated. 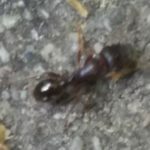 When ants invade a home, it is best to contact a pest control professional to properly identify the ant and develop an effective management strategy.